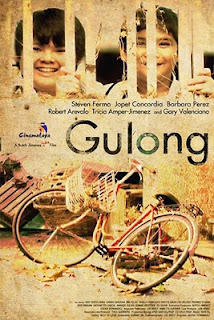 GULONG is about friendship, love and life. The story is told from the point-of-view of Apao, a smart, kindhearted boy whose quest for an old bicycle reveals the stuff he is made of. With him on this adventure are his insan Momoy and his bespren Tom-Tom. The story begins with a question: How are our 3 friends going to spend their summer vacation? Tom-Tom suggests that they go to his uncle's fishpond, an hour's bike ride from where they live. Apao and Momoy have a problem - they don't own a bike! There are no jeeps and it is too far to walk. Momoy finds an old bicycle but the owner, an old woman named Tita Maggie, will only give it to him if he pays her a hundred pesos. He agrees and promises to come back with the money the next day. This starts a series of events which affects Apao, his friends, his family and even his community. In the end, a discarded 40 year old bicycle connects the past to the present and becomes a catalyst for healing old wounds and reviving a love affair that has long been left for dead.